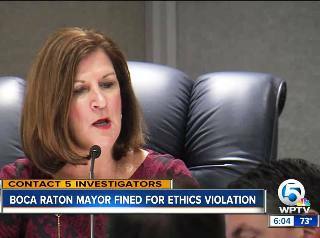 BOCA RATON — Boca Raton Mayor Susan Haynie admitted Monday that she violated the county’s code of ethics when she voted on projects that gave “a special financial benefit” to her firm’s client, developer James Batmasian. She was fined $500 and given a letter of reprimand in a settlement with the ethics commission. The ethics commission launched a probe into Haynie’s business ties in November after The Palm Beach Post revealed Haynie’s connection to Batmasian, the largest commercial landowner in the city. The commission investigated two possible offenses — misuse of public office and failure to disclose voting conflicts. The commission noted in the settlement that Haynie’s violation “was inadvertent” because of advice she says she got from the city attorney. The Florida Commission on Ethics is investigating Haynie’s failure to disclose her business on mandatory state financial disclosure forms. The state commission has the power to fine elected officials up to $10,000 and recommend their removal from office to the governor. Haynie, a longtime Boca Raton political figure and Republican candidate for Palm Beach County Commission, and her husband founded a property management firm that for years had collected thousands from a company controlled by Batmasian and his wife, Marta. Haynie’s firm also earned at least $64,000 for installing security cameras at four properties owned by Batmasian, including $22,000 for work at the 15-acre Royal Palm Place near Mizner Park downtown, the investigation revealed. The Post asked Haynie about the security camera work last year. Haynie said her husband didn’t earn any money on the job. Marta Batmasian, who co-owns the plaza with her husband, told investigators that Haynie’s firm earned the $64,000 in 2017, around the time Haynie cast her most recent vote on a Batmasian project. Haynie voted in June to allow Batmasian to open shops and restaurants at an industrial plaza on Northwest 20th Street, raising the value of the 8-acre parcel in an area where Haynie has championed a major revitalization effort. The security camera work was “a stronger connection” between Haynie and Batmasian than the property management contract, Bannon said. The ethics commission cited the security camera job as evidence that Batmasian was a direct client of Haynie’s business. The property management job — which payed up to $14,400 a year — was an indirect link because Batmasian only owned a majority of units at a Deerfield Beach condominium complex that hired Haynie’s firm. Batmasian had a controlling vote on the board of the Deerfield Beach complex and loaded the board with his employees, The Post reported. One of the board members, Batmasian’s employee Ann Waller, recorded a video testimonial for Haynie’s business website, lauding the installation of security cameras at Batmasian properties. Haynie voted on at least a dozen projects that benefited Batmasian without disclosing the business link, The Post found. The ethics investigation cited four of those votes in the case against Haynie. Many of the votes cited by The Post were outside a two-year statute of limitations or lacked concrete evidence of special financial benefits, Bannon said. “We used the strongest, clearest votes we had on record,” Bannon said. A month after The Post story, Haynie announced that her husband had ended his firm’s contract with the Batmasian-controlled Deerfield Beach complex. She steadfastly denied any conflict of interest until her ethics hearing Monday. During the closed-door hearing, made public on tape after it concluded, Haynie’s attorney Mark Herron argued there was no probable cause that Haynie violated two county ethics codes — misuse of office and failure to disclose a voting conflict. Herron also argued that Haynie relied on misleading advice from Boca Raton city attorney Diana Grub Frieser, who sought an ethics opinion, in which neither Haynie nor Batmasian were named, on Haynie’s behalf in 2013. Without identifying Haynie or Batmasian, Frieser sought the ethics advisory opinion to see if Haynie could vote on an upcoming project. After several revisions over months, the commission found that she could vote under narrow circumstances. The opinion’s circumstances were so narrow, however, that it didn’t apply to Haynie’s votes, The Post found. “We’re not privy to those conversations (between Haynie and Frieser), but her attorney was simply wrong as far as we’re concerned,” Bannon told The Post Tuesday. The ethics commission determined that two of Haynie’s violations were “inadvertent or unintentional” because “she relied on the advice of the city attorney prior to participating in and voting on the matters,” investigation documents read. Haynie admitted to one violation, for her firm’s security camera work, and the commission did not say whether or not the violation was intentional. Frieser could not be reached for comment Tuesday. “She voted on something that she had no business voting on because there was a special benefit to her outside client,” Bannon said. Haynie said in the statement to The Post that she is pleased the investigation concluded.